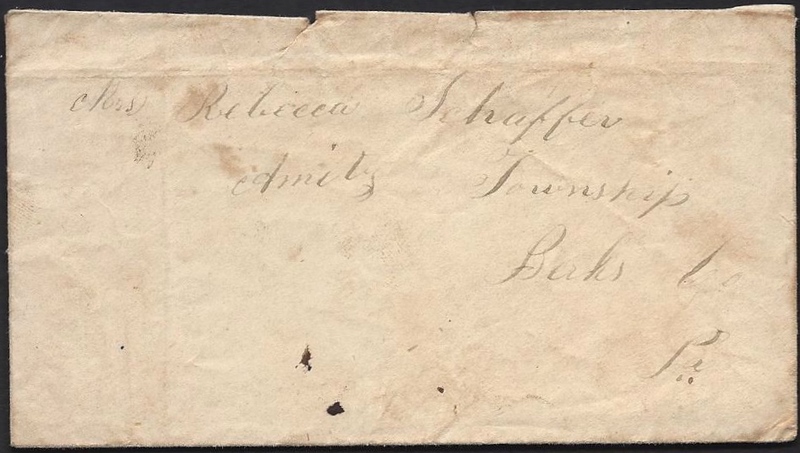 These letters were written by Jacob H. Schaeffer (1836-1861), the son of George M. Schaeffer (1801-1883) and Esther Hill (1807-1882) of Berks County, Pennsylvania. 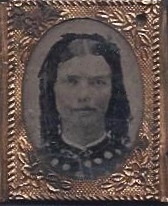 Jacob was married to Rebecca Breidenstein (1838-1918) in 1855 and had three children prior to his enlistment in Durell’s Independent Battery D in August 1861. 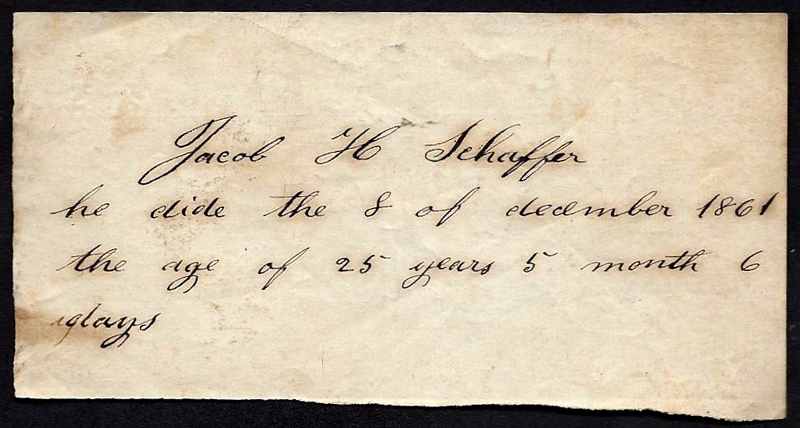 Slip of paper with Jacob’s death date recorded found in family papers. 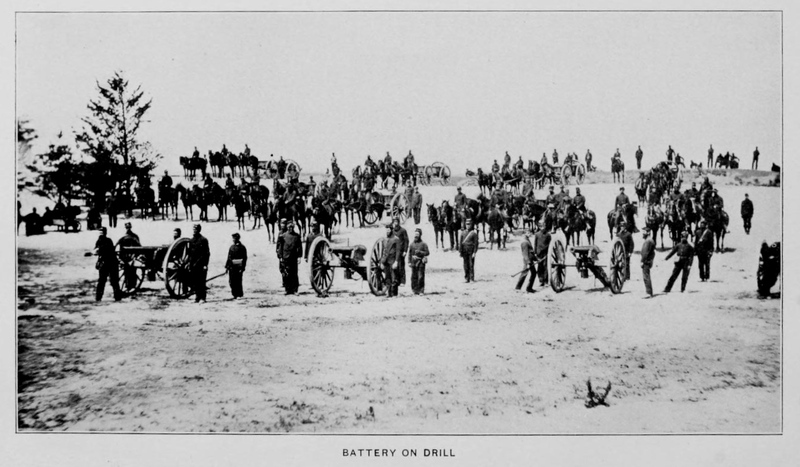 The history of Durell’s Battery in the Civil War published in 1903 (pg. 17) states that Captain Durell “arrived at Camp Lacey, located on the Doylestown fair grounds [outside Reading, Pennsylvania], where Colonel [W. W. H.] Davis had already gathered half a dozen companies of infantry, on September 13th, 1861, accompanied by thirty or forty recruits, principally from Berks County.” It is assumed that Pvt. 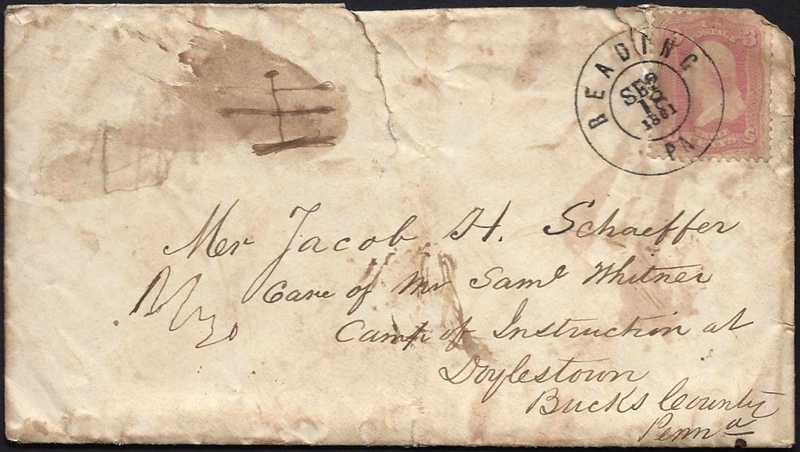 Jacob H. Schaeffer was among these recruits for the following letter was written by him on that date from Reading to his wife Rebecca. Jacob’s name was recorded on the company roster of 24 September 1861. The news of Jacob’s enlistment must have come as quite a surprise to Rebecca who was at home in Amity Township with three small children. I take the opportunity to send you these few lines [to let you know] that I am going to war and that you need not trouble yourself about it. Sassaman has promised to give you grain until Spring and he did not want me to go but I was compelled to go by Capt. Durell. No more at present. You shall soon hear of me again. Only take good care of the children. I will send you money as soon as I will receive any. 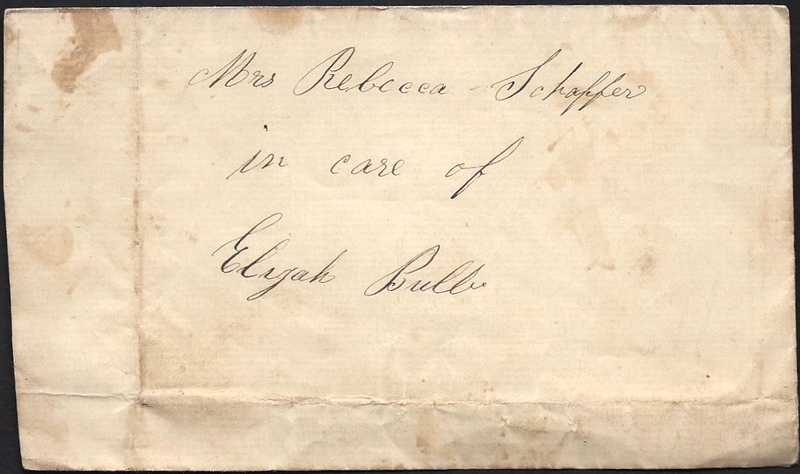 The following letter was written by Elijah Bupb (1813-1891), a blacksmith in Amity Township, Berks County, Pennsylvania, who was apparently a near neighbor of The Schaeffer family. In the letter, Elijah informs Jacob that he is taking care of Jacob’s wife and that she is anxious for him to come home to talk to her about his enlistment. 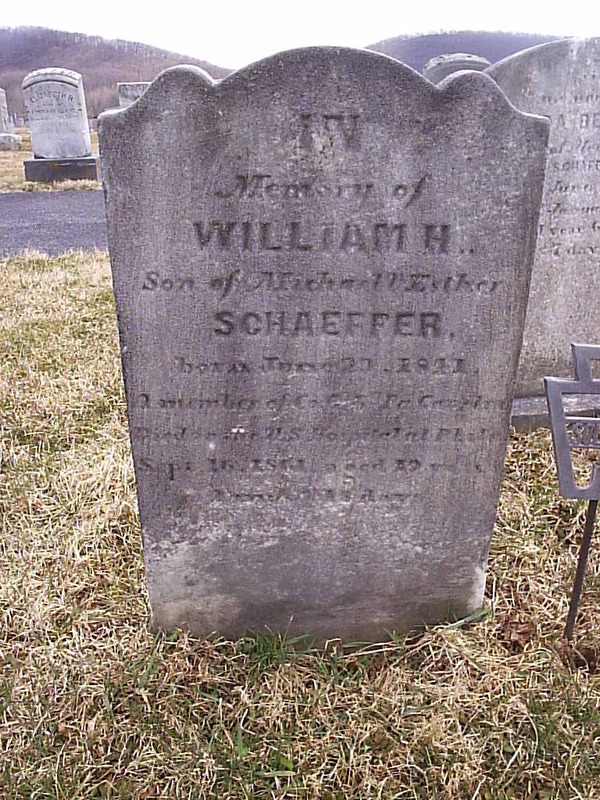 Elijah also informs Jacob that his brother, William H. Schaeffer — a member of the 6th Pennsylvania Cavalry — has died and his body has been returned home for burial. I will inform you that your wife has been here with me and inquired whether you said anything to me that you would send her any means to get along. I told her you did not say anything to me but I said I would write and ask you to send her some money as soon as you could get along. And I will help you all in the lodge that is in my power to do and after I have all things fixed in the [ ], I will let you know how I have fixed it. And if any news comes about your wife that was cross, just don’t believe it. She does not care about anything if only you would come back once more and talk with her. And I will inform you that your brother William ¹ is dead and he is brought home. Direct your letter of reply to me care of Capt. McKnight, Reading, Pennsylvania, and I will get it sooner. ¹ Pvt. 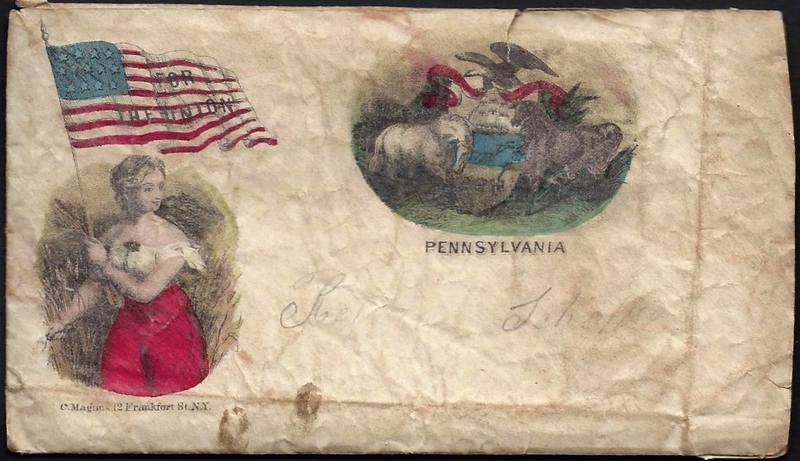 William H. Schaeffer (1841-1861) enlisted in Co. G, 6th Pennsylvania Cavalry on 8 August 1861. He died on 16 September 1861 and is buried in Olney Cemetery, Spangsville, Berks County, PA. In this letter, Jacob Schaeffer tells his wife Rebecca that he is at Camp Lacey and that he had attended a dinner in the city of Reading held in the honor of the company. I now take my pen in hand to inform you that I am well at present and hope that these few lines may find you in the same state of health and the children too. We have arrived at the camp on Tuesday evening half past 7 o’clock. We have had a bully dinner in the city. Our company is very near full. I didn’t get my fortune told. I want you to write to me soon and tell me what folks talk about me. Direct your letters to Doylestown, Camp Lacey, and then I will get it. In this letter, Jacob Schaeffer tells his wife Rebecca that he is at Camp Lacey and describes the daily drill routine of the company. He mentions attending a Union mass meeting held in a grove near Danborough, five miles from camp, on the 5th of October. I take the present opportunity to let you know that I am well at present and hope that these few lines may find you in the same state of health and I want to let you know this is my second letter and have not received an answer. I want you to write as soon as you get this letter and let me no whether you have received my letter or not. We are all a getting along very well and we have a good deal of work now. Our drill hours are from 10 to 12 and from 2 to 4 and then we have our supper and right after supper dress parade till sundown, at 9 o’clock roll call and 10 minutes after the lights must be blown out and all must be quiet inside of camp. On the 5th of October we attended a Union Meeting about 5 miles from camp at or near Danburg [Danborough] which was addressed by several of the citizens from Doylestown. There was between 3 to 4,000 people there. We have now 100 men enlisted in our company and we expect to leave this place before long. Now don’t forget to write as soon as possible for I would like to hear of you and the children. No [more] at present. Direct your letter to Doylestown Post Office, Camp Lacey, Ringgold Artillery in care of Capt. Durell. In this letter, Jacob Schaeffer discusses some personal matters with wife Rebecca. I take the opportunity to write a few lines to you and let you know that I am well and hope that you are in the same state of health and the children are all well at present. And I can move at Samuel Brunner but I don’t want to go there and your sister didn’t come up to me and I will stay alone till next month. I will go up to Reading this week with Elijah Bubp and then I’ll send you a letter next week but you shall send the certificate up as soon as you can. This is the second letter that I wrote to you. I and Elijah Bubp did send a letter down the first of October and that had a great attack about you and you don’t write whether you like it. The rose is read, the violet blue, honey is sweet and so are you. In this letter from Camp Lacey, Jacob Schaeffer tells his wife Rebecca that despite what some of the neighbors at home may think, he did not enlist in Durell’s Battery to avoid work at home. He tells her that they expect to leave for Washington D. C. shortly. 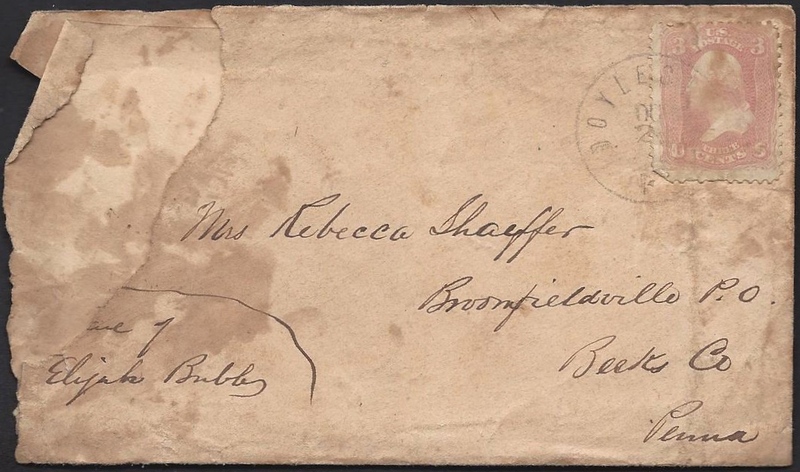 Addressed to Mrs. Rebecca Shaeffer, Broomfieldsville P. O., Berks County, Penna. I send you these few lines that I could not get my certificate any sooner and I like it very well. But here most nobody thinks that going to war is for to get rid of work. We must work harder than I did at home. But for all that, I would not wish myself back before the war is over. We do not expect to stay here more than a couple days and I think we will be in Washington sometime next week about this time. But I want you still to write to this place for fear we might not get off and we will get it. I never received your first answer. 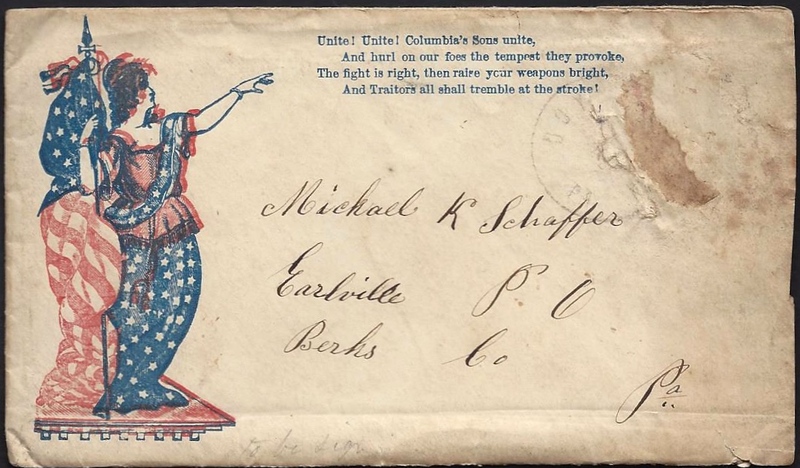 In this letter from Camp Lacey, Jacob Schaeffer tells his wife Rebecca that he likes camp life “very well” and that the 104th Pennsylvania Infantry with whom their battery was attached was nearly filled, well drilled, and ready to go to Washington D. C.
Addressed to Michael K. Schaffer, Earlville P. O., Berks Co., Pa. I take the present opportunity to inform you that I am well at present and hope that these few lines may find you in the same state of health, and I like camp life very well and I am heartier than ever. I was at home and have never commenced anything yet that I liked better than soldier life and I am not a bit sorry yet for enlisting my name for the war. We have plenty of good food and good clothing too and we will leave Camp Lacey in 6 or 8 days for another place and I think we will go to Washington. Uncle George and Jacob Hill — they are well, and cousin Octave Hill has knitted me a pair of socks and made me a pin cushion and sent word with Samuel Whitner that I should come there if I would come out to town and I am going to get there before we leave here. I got a letter of my wife that Elizabeth has not been over with her that week and that she was a going to stay alone till Amelia would come down and I wish you would tell [my brother] Miles that he would give her some of that money as soon as possible for I think she is in need of it. I will send her money as soon as I can. I do not know how soon we will get our pay but I think we will have to wait till two months has expired. That will be the 24th of November but then we will get it. There are ten infantry company in our regiment [104th Pennsylvania] besides our Battery and each company contains 101 men but it is not quite filled up yet. But there are new recruits coming in every day so that we will be filled up in a few days and may be ready for action. I did not send my certificate home but I wish you would tell my wife about this letter and see whether she has received her certificate or not. I was trying to come home yet once before we would leave here but I could not get off on account of leaving too soon that they would not grant a furlough for as long as I wanted it so I thought that I would not come for this time. I do not know when or what time I will or can [come] home. It will be quite unexpected when I do come. No more at present. I take the present opportunity to let you know that I have received your letter and you had stated that you were all well and I am glad to hear that you are well and I am the same. And you said about sending money. I can’t send any money till I get it but I will send you some as soon as I can. We won’t get our pay before two months is up. Then I will send you some. And you did not tell me whether you got your certificate in your last letter that you got of me. I sent it and I want you to let me know whether you got it or not. It was not a printed one; it was written by our officers and signed by our colonel. And you said that that you had nothing but trouble. I don’t want you to trouble yourself about me because I will send you all the money that I can and if my sister won’t come to you, why you must try to do as well as you can or try to get somebody else to come to you. And about getting your black clothes, you may do just as you like. If you want to get some, you can. And if you don’t, why I don’t care anything about it. You must try to do as well as you can. I think it is but a short time. Then we will all come home again. Answer back as soon as you receive this letter because we will leave this place by the coming Wednesday. Sugar it is sweet, and so are you — my dear. Having a few leisure moments, I sit down to write a few line to you [to let you know] that we have left Camp Lacey at half past five o’clock in the morning and went to Philadelphia and marched through the city and there we took refreshments and then marched down to the Baltimore Depot and left for Baltimore at half past 3 o’clock and came to the first station called Chester. Hearty cheers were given and pistols fired at the stopping place but all for the Union, and the next was Wilmington and then across the Chesapeake Bay in the night and came to Baltimore at 5 in the morning. Then we marched through the city to the Washington Depot and left for that place and came there about 2 o’clock and got refreshment there, and we marched through the city, and out to the hill which is called Kalorama Heights — about two miles from the city. It is a very nice place here and the soldiers seem to be very well pleased with their new home. We can see across the Potomac River and away down to Alexandria in Virginia. We have not seen the rebel troops yet but I think we will soon be ready to meet them in an open field for action. And we hear a great deal of firing every day but it is all of our Union troops and the place where we do encamp is surrounded by woods belonging to a secesh man. We just go in and out, down trees for to do our cooking with or to take rails from the fence. In this letter from Kalorama Heights, Jacob Schaeffer tells his wife Rebecca about the trip from Reading, Pennsylvania, to Washington D. C., and of their encampment at Camp Davis. He mentions three of his comrades that he shares a tent with. Having a few leisure moments this afternoon, I take up my pencil to let you know that I am well at present and hope that these few lines may find you all in the same. We have left Camp Lacy on the 6th and reached Washington on the 7th in the afternoon at 2 o’clock and took our grub there and then we laid there until near sundown. Then we marched out on the hills and come to the place about 7 o’clock in the evening and we did not pitch our tent that evening so we had to lay down in the open air that night and we had a pretty hard frost. In the morning our knapsacks and haversacks were covered with ice. But some had some other idea for passing the night. They went to work and cut down trees and started a large campfire and lodge around the fire. We were all pretty jolly all the time. I went in a tent with a nice set of young men — myself, [Corp.] Bertolett Yoder, [Pvt.] Mahlon Hill, [Pvt.] Urias Engle (brother to John in New Stoneville). Mr. Yoder is a son of Solomon Yoder from Oley. We get along very well. I do not know that we will stay here very long but we will not be taken at a very dangerous place yet because we have no arms yet — that is, our company — but the infantry companies have their arms are ready for action so we think we will get our ars in a day or so. There is regiments coming and going everyday. There was one New York Regiment came in yesterday and is [one] hundred and 54 men with their officers and I don’t think that they will stay any time. We can see over the Potomac and over to Virginia in Alexandria where Col. Ellsworth was shot for taking down the palmetto flag and we have heard that Old Jeff was taken prisoner but we do not know whether it is true or not but if it is, the war will soon be ended and then we will soon return to our homes again, and let the stars and stripes wave over our Nation forever. The cry is that the stars and stripes are floating in South Carolina again and thank God that they will never be removed anymore. We can hear the cannons roar along the Potomac but not for any purpose only for practice. I want you to answer my letter and let me [hear] something about you. Direct your letter to Jacob H. Schaffer, Ringgold Regiment, Lt. Artillery Pennsylvania Volunteers, Washington D. C., Care of Captain Durell. Don’t forget to answer my letter. I can’t pay my letters’ [postage] just now because my money is all [gone] at present. Having a few leisure moments this morning, I sit down and in pleasure to inform you that I am well at present and hope that these few lines may find you in the same state of health and let you know that I received your note on the 15th at Camp Duncan and was glad to hear that you were all well at the present time and hope that you may all stay so until I will come back. We have only laid at Camp Davis on Kalorama Heights one week and then we left for Camp Duncan. The orders came about 11 o’clock and till one o’clock we had to be ready to march and then we went through the city and about three quarter of a mile on the other side of the Capitol and then it rained all the afternoon and all night and we pitched our tents right down in the mud and water and then we lay down and rested very well that night. And then it rained all day yet too, and the next day it cleared up and [got] pretty cold too, and very stormy all day on Saturday. And then we moved about a half a square still nearer to the capitol. Camp Duncan is an artillery camp. There are no infantry with us in the whole camp and we had a great time in pitching our tents for it was awful stormy all day and we had great fun by all in all the storm and we have a very ____ place where we are now. We can see nearly all over Virginia. I have been down at the west branch of the Potomac but we seen very far down the river. And you had stated that I should come home at Christmas but I do not think that I can because it would cost me more than one month’s wages and that would hardly pay. I do not think that I will come home that quick unless we will be free till that time. We do not expect that we must stay all winter and so I do not think that I will come till I expect to stay at home and that will be between now and next spring for they send our troops in the southern states with fleets and are taking all the forts and then the war will son be ended. But you said in your letter that you were a going to wait until the holidays before you would rent a house. But you can tell my father that I said that you should try to get a house as soon as you can and I would advise you to get a house that there is somebody living with you so that I am not liable to work for a man when I do come for I want to work there again but not anywhere. And if you rent a house that way, why then I can go wherever I please. And I would try to get one someplace near to my father for then they can come to see you oftener. And tell my father that he should try to get a house that there is not so a high rent to be paid so that it won’t cost you a great deal for rent. And so you must try to do as good as you can until we get our pay and I will send you some and all — very near all — because I do not want a great deal of money here. And I want you to let me know in your next letter whether Lizzie can walk or not and whether Morris can talk anything yet or not for I think it is soon time for him to commence or else I will be home again before he can talk. And I would like to hear him talk when I do come home and you said that there was some talk about our boys but you did not say what. But I want you to write a longer letter and tell me what was the talk for if you heard anything about me, tell me to [paper creased] it was anything out of the way, you can be sure that it is not true for you know what I promised you and you can depend uponit that I will keep it for I did not go to war to act mean and so I don’t intend to do so either. And so I want you to tell me what it is and about the fuss that they had about me when I left home. You did not tell me what the talk was and I want you to tell me what the talk was and who it was that did talk about me. And tell me the truth, let it be whoever it will, because I want to know it before I do come home for if you don’t tell me before I do come home so that I can forget it till I come home. And let me know whether you had your fortune told or not. And if you had, I want you to tell me what she did tell you and tell me all and the truth for I don’t want to know anything but the truth. We have had a hearty dinner. It was boiled rice and sugar. We have quite white sugar. We have had crackers one week but now we have fresh bread and fresh beef too, and plenty of it too, and we are all getting very fat and have plenty of food. We have a great time in our tent in the evening. No more at present and you must excuse me for my bad writing because we have not a very good place but we take it very content and are very well satisfied for what we have. Said to be a photograph of Durell’s Independent Battery D. Pvt. Jacob Schaeffer was already dead when this photo was taken — the first casualty of the company.